"terumah" redirects here. For other uses, see terumah (disambiguation). A heave offering, or terumah (Hebrew: תְּרוּמָה‎), plural terumot, is a kind of offering. The word is generally used in the positive sense of an offering to God, although sometimes it is also used in a negative sense, such as the ish teramot, a "[dishonest] judge who loves gifts". In Chazalic literature it is listed as one of the twenty-four priestly gifts. The consumption of terumah is restricted by numerous Torah-based rules and could be eaten by priests, their families, and their servants. The terumah may be consumed only in a state of ritual purity. This is also called the "great offering" (Hebrew terumah gedolah תרומה גדולה) which is, usually, a food item given to the Jewish priest, as a gift. The thirteenth-century French rabbi Hezekiah ben Manoah explains the adjective "great" (Hebrew gedolah) to be because this terumah is the first of all tithes given on produce and thus is given from the "greatest quantity of produce" before any other gift is given. The term occurs seventy-six times in the masoretic text of the Hebrew Bible; in the Septuagint it was rendered afieroma (ἀφiαίρoμα), in JPS Tanakh (1917) it is generally translated "offering"; while in the King James Version (1611) it is also generally translated "offering" but also sometimes "oblation" and four times "heave offering". The word is used in various contexts throughout the Hebrew Bible, including one use in Proverbs denoting haughtiness or graft (Proverbs 29:4). In most contexts it refers to designating something for a higher purpose, or lifting apart of a quantity from a larger quantity), as in the gifts offered by the Children of Israel for the inauguration of the Mishkan (as described in the Book of Exodus). In the Bible, there are numerous different varieties of gifts for which the term terumah was applied. In Jewish law, the word terumah by itself was associated with "great offering" (terumah gedolah), the first portion of produce that was required to be separated and kept pure for consumption by a kohen (priest). There was no direct connection with the Jerusalem Temple or the Temple service. 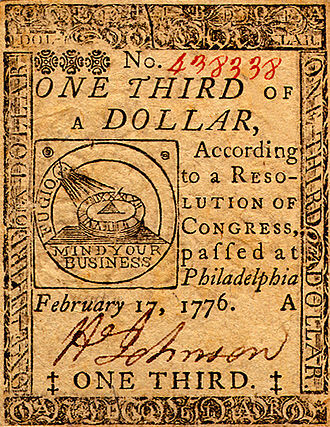 Tithe of First fruits (Hebrew bikkurim בכורים) (Not done in the absence of a Temple in Jerusalem). The general offering (terumah) or the "great offering" (terumah gedolah) was a portion of the finished grain, wine and oil separated for the Jewish priest prior to the "first tithe" (maaser rishon) separated for a Levite . Unlike the "first tithe" (maaser rishon), the Torah did not specify any minimum measure for a terumah offering; hence, even one grain of barley could satisfy the requirement to separate terumah. A passage in the Book of Ezekiel suggests that the "great offering" (terumah gedolah) should consist of 1/50 of the owner's grain, wine or oil. The Mitzvah of Challah ("dough bread", challah חלה) Contemporary practice is to burn rather than give to the priest. Portion of gift offerings, of slaughter offerings, which were allocated to the priests. Portion of the terumat hamaaser, the Levite Tithe, which applies only to produce grown in the Land of Israel. The Mishnah, Tosefta, and Gemara, include a tract entitled Terumot ("Offerings"), which deals with the laws regulating raised offerings. According to Jewish Law, the "great offering" (terumah gedolah) could only be separated from the non-tithed produce (tevel), and "tithe offering" (terumat maaser) only be separated from "first tithe" (maaser rishon), by its owner, or an authorized, legally permissible agent; minors, deaf-mutes, the mentally ill and non-Jews were not obligated to perform such separation (Terumot 1:1). However, while non-Jews could not act as agents for Jews to separate terumah, the terumah owned by and separated by non-Jews was considered valid and had the status and sanctity of terumah (Terumot 3:9). Based in part on the measures described by the prophet Ezekiel, Jewish Law set the minimum amounts of the "great offering" at 1/60 of the finished produce for a poor person, 1/50 for the average person, and 1/40 for the generous. The "tithe offering" (terumat maaser) was always 10% of the "first tithe" (maaser rishon). The Talmud opens with a discussion of when the Shema Yisrael ("Hear O Israel") prayer should be recited. The Mishnah states that it should be recited when priests who were "unclean" (tamei, טָמֵא ritually impure) are able to enter the Temple to eat their terumah raised-offering (Brachot 2a). This passage is one many which intimately connect the daily rites of Rabbinic Judaism with details of the rhythm of the life of the Temple in Jerusalem. The heave offering of the tithe, though mentioned by the Priestly code is not mentioned in the Deuteronomic code; critical scholars believe that this is because the Deuteronomist regarded all Levites as being able to become priests, and not just Aaron's descendants, hence this tithe of a tithe would be meaningless. According to the Jewish Encyclopedia article (1907) this assumes that the Book of Deuteronomy was written before the books of Leviticus and Numbers, and also requires the assumption of an unrecorded and previously unknown revolution in the Jewish world. Terumot - plural of Terumah, and a section of the Mishnah concerning tithing obligations. Terumah (parsha) - the nineteenth weekly portion of the Torah. It primarily contains the instructions on how to create the Tabernacle. 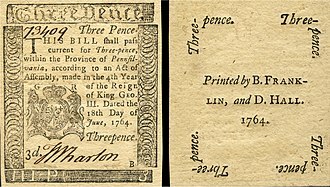 ^ Brown Driver Briggs Hebrew Lexicon entry for terumah, citing Proverbs 29:4 "The king by judgment establisheth the land, but he that receiveth gifts overthroweth it." ^ Sidrah Sparks: Talking Torah at the Table with Your Family p329 Rabbi Dov Peretz Elkins - 2010 "The word “Terumah” comes from the Hebrew root “rum” – meaning rise, or elevation"
^ Jewish antiquities: or, A course of lectures on the three first books p198 David Jennings, Philip Furneaux, Thomas Godwin - 1825 "This waving was of two kinds; one called terumah, from rum, elevatus est, which, they say, was performed by waving it perpendicularly upward and downward ; the other, tenuphah, from nuph, agitare, movere"
^ Joel Gereboff Rabbi Tarfon, the tradition, the man, and early Rabbinic Judaism 1979 "K. This [the opinion that an Israelite betrothed to a kohen may eat heave-offering prior to her nissu'in, is the] first mishnah. " ^ Jacob Neusner The modern study of the Mishnah p240 - 1973 "one may assume that in the case of one who gives heave-offering for oil instead of for crushed "
^ Simcha Fishbane Deviancy in early rabbinic literature p153 - 2007 "above laws that are intrinsic to the Land of Israel.34 Yet we find a Mishnah in Tractate Terumot (3:9) that states: “A gentile and a Samaritan, that which they separate is [valid] raised offering and that which they take as tithes is ""
The priestly breastplate was a sacred breastplate worn by the High Priest of the Israelites, according to the Book of Exodus. In the biblical account, the breastplate is sometimes termed the breastplate of judgment and these stones were, at times, used to determine God’s will in a particular situation. It should be noted that using these stones did not always determine Gods will, if any other way was not given by God, the high priest would find Gods guidance. The description states that the breastplate was to be formed from one rectangular piece of cloth—⅓ of a cubit by ⅔ of a cubit. The Hebrew term for the breastplate, חֹשֶׁן‎, appears to be named from its appearance, probably derived from the source as Arabic حسن‎. The 19th-century German biblical scholar August Dillmann thought that it was likely to be derived from the Hebrew word חֹצֶן‎, meaning fold. According to the Talmud, the wearing of the Hoshen atoned for the sin of errors in judgement on the part of the Children of Israel, the word has its equivalent in the Greek, σμήρις. There was a different order for the names inscribed on the two stones, carried on the High Priests shoulders. Others suggest that they were engraved with emery, having the property of a diamond used in cutting other stones. Explanation of the meaning of the jewels generated a great deal of both Jewish and Christian writing, and was a staple component of the tradition of lapidaries or books on gemology. The jewel stones are as follows, Odem / Sardios - both names mean red, and probably refers to Sard, a common stone in classical cultures. All authors agree that stone was of a red colour. The Chinese Union Version refers to this stone as being a ruby, bareḳet / Smaragdos - Bareketh etymologically means ‘lightning flash’, whence shimmering or shiny. Smaragdos was often used in Greek literature to refer to a bright crystal found in columnar formations. Emerald in the sense of green beryl exists locally in Egypt. Items carved from emerald are known from as early as the 12th Dynasty, 1900s BCE, but these emeralds are random finds, and not actively mined until the Ptolemaic period. The dough offering is a positive commandment requiring the owner of a bread dough to give a part of the kneaded dough to a priest. This commandment is one of the twenty-four kohanic gifts, the common modern practice in Orthodox Judaism is to burn the portion to be given the Kohen, although giving the hallah to a Kohen for consumption is permitted outside of Israel. Of the first of your dough you shall lift up a cake as an offering, as the offering of the threshing floor, so you shall lift it up. From the first of your dough you shall give to the LORD an offering throughout your generations In the above passage cake is khallah while of dough is ariycah. The return of the Jews from the Babylonian exile marked a renewal in adherence to numerous commandments, and the dough offering, the Mishnah contains a tractate M. Hallah dealing with the dough offering. Among the rulings are that it was prohibited to set aside dough offering and tithes from dough made from grain harvested after the New Year, in behalf of dough made from old grain. The mitzvah of challah, is believed by some scholars to originate in the priestly source. Other insights on the symbolism of Challah appear in Midrashic and Kabbalistic literature, the Mitzvah of separating challah is traditionally regarded as one of the three Mitzvot performed especially by women. The mitzvah of challah is one mitzvah with two parts, separating the required dough, giving the dough to a Kohen. Nachmanides as well as the Tosafist Isaiah di Trani explain that it is the giving of the Challah portion to the Kohen that is the primary component of the Mitzvah. The minimal quantity of dough whose preparation mandates the performance of the Mitzvah is quantified by Chazal as a portion of flour equivalent to 43 and 1/5 eggs, in modern terms, The quantity that qualifies the reciting of a Brocha is about 1.64 kg. A quantity of flour weighing between 2 lb 11oz and 3 lb 11oz, qualifies for giving Challah but no Brocha is recited The Torah does not specify how much dough is required to be given to the Kohen, this is discussed in the Talmud. Sacrifice is the offering of food, objects or the lives of animals to a higher purpose, in particular divine beings, as an act of propitiation or worship. While sacrifice often implies the ritual killing of an animal, the term offering can be used for bloodless sacrifices of food or artifacts, for offerings of liquids by pouring, the term libation is used. The Latin term sacrificium derived from Latin sacrificus, which combined the concepts sacra, the Latin word sacrificium came to apply to the Christian eucharist in particular, sometimes named a bloodless sacrifice to distinguish it from blood sacrifices. In individual non-Christian ethnic religions, terms translated as sacrifice include the Indic yajna, the Greek thusia, the Germanic blōtan, the term usually implies doing without something or giving something up. But the word occurs in metaphorical use to describe doing good for others or taking a short-term loss in return for a greater power gain. Scholars such as René Girard have theorized that scapegoating may account for the origins of sacrifice, animal sacrifice is the ritual killing of an animal as part of a religion. It is practiced by adherents of religions as a means of appeasing a god or gods or changing the course of nature. It served a social or economic function in those cultures where the portions of the animal were distributed among those attending the sacrifice for consumption. Animal sacrifice has turned up in almost all cultures, from the Hebrews to the Greeks and Romans, Ancient Egyptians and it is against their religion for Egyptians to sacrifice animals, except for sheep, calves, male calves and geese. 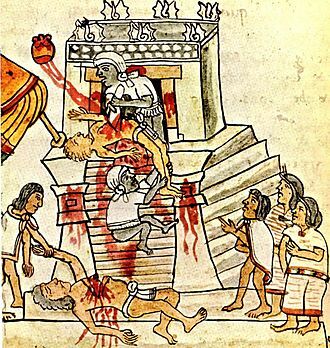 Animal sacrifice is practiced today by the followers of Santería and other lineages of Orisa as a means of curing the sick. However, in Santeria, such animal offerings constitute a small portion of what are termed ebos—ritual activities that include offerings, prayer. Christians from some villages in Greece sacrifice animals to Orthodox saints in a known as kourbània. The practice, while publicly condemned, is often tolerated, according to Walter Burkert, a scholar of sacrifice, Greek sacrifices derived from hunting practices. The priestly robe, sometimes robe of the ephod, is one of the sacred articles of clothing of the Jewish High Priest. The robe is described in Exodus 28, 31-35 and it was worn under the Ephod. Like all the garments, it was to be made by gifted artisans. Filled with the spirit of wisdom and it was a sleeveless, purple-blue or violet robe, woven in a single piece. The opening in the center for the High Priests head to pass through was woven, the lower hem of the garment was fringed with small golden bells alternating with pomegranate-shaped tassels of blue and scarlet wool. The golden bells were a necessity, and they must ring when the High Priest entered the Holy of Holies on the Day of Atonement, lest he die. ”According to the Talmud, the wearing of the priestly robe atoned for the sin of evil speech on the part of the Children of Israel. In traditional Rabbinical teaching, each of the robes is intended to atone for a particular sin on the part of the Children of Israel. The eminent sage Rashi points out in his commentary on the Talmud that the robe was fashioned to atone for the sin of an evil tongue, speaking poorly about someone else. Kohen or cohen is the Hebrew word for priest used colloquially in reference to the Aaronic priesthood. Jewish kohanim are traditionally believed and halakhically required to be of direct descent from the biblical Aaron. The term is used colloquially in Orthodox Judaism in reference to modern day descendants of Aharon, during the existence of the Temple in Jerusalem, kohanim performed the daily and holiday duties of sacrificial offerings. Today, kohanim retain a lesser though distinct status within Rabbinic and Karaite Judaism, in the Samaritan community, the kohanim have remained the primary religious leaders. The noun kohen is used in the Torah to refer to priests, the Hebrew noun kohen is most often translated as priest, whether Jewish or pagan, such as the priests of Baal or Dagon, though Christian priests are referred to in Hebrew by the term komer. The word derives from a Semitic root common, at minimum, to the Central Semitic languages, as a starkly different translation the title worker, Rashi on Exodus 29,30 and servant Targum to Jeremiah 48,7, have been offered as a translation as well. Some have attempted to resolve this contradiction by suggesting that, although the priest does enjoy specific privileges. The status of priest kohen was conferred on Aaron, the brother of Moses, during the 40 years of wandering in the wilderness and until the Holy Temple was built in Jerusalem, the priests performed their priestly service in the portable Tabernacle. Their duties involved offering the daily and Jewish holiday sacrifices, and blessing the people in a Priestly Blessing, in a broader sense, since Aaron was a descendant of the Tribe of Levi, priests are sometimes included in the term Levites, by direct patrilineal descent. However, not all Levites are priests, when the Temple existed, most sacrifices and offerings could only be conducted by priests. The Torah mentions Melchizedek king of Salem, identified by Rashi as being Shem the son of Noah, the second is Potiphera, priest of Heliopolis, priest of Midian both pagan priests of their era. When Esau sold the birthright of the first born to Jacob, Rashi explains that the priesthood was sold along with it, because by right the priesthood belongs to the first-born. Jehoiada in the Hebrew Bible, was a prominent priest during the reigns of Ahaziah and Joash. Jehoiada became the brother-in-law of King Ahaziah as a result of his marriage with princess Jehosheba, both Jehosheba and Ahaziah were children of King Jehoram of Judah. Ahaziah died a year after assuming the throne, which was usurped by his mother Athaliah and Jehoiada rescued from Athaliahs slaughter, Athaliahs one-year-old grandson, Joash. For six years, they hid the sole surviving heir to the throne within the Temple, Jehoiada was instrumental in the staging of the coup that dethroned and killed Athaliah. Under Jehoiadas guidance, Baal-worship was renounced and the altar and temple of Baal were destroyed, Jehoiada is noteworthy for the national covenant that he made between him, and between all the people, and between the king, that they should be the LORDs people. Jehoiada lived 130 years and was buried very honorably among the kings in the city of David, Jehoiadas son, was martyred by King Joash. The Sons of Zadok are a family of Jewish priests, descended from Zadok, the first high priest in Solomons Temple. The Tanakh records how prior to the death of Aaron at Hor HaHar, he was accompanied by his brother Moses, as well as his elder son Eleazar and younger son Ithamar. Upon entry to the cave where Aaron died, he witnessed as his brother Moses dressed his elder son Eleazer with the clothes of the high priesthood, as initiation to high priesthood. Similarly, the Hebrew Bible relates how, at the time Phineas son of Eleazar appeased Gods anger, he merited the divine blessing of God, Phineas the son of Elazar the son of Ahron the Kohen. Torah commentators such as Yosef Karo and explain that the continuity of high priesthood is put forth to the descendants of Phineas from this noted verse. Torah commentators record that Phineas sinned due to his not availing his servitude of Torah instruction to the masses at the leading up to the Battle of Gibeah. In addition, he failed to address the needs of relieving Jephthah of his vow. As consequence, the priesthood was taken from him and given to the offspring of Ithamar, essentially Eli. This prophecy of Elkanah ultimately happened in the era of King David when Zadok from the progeny of Eleazar was appointed as high priest. The Metzudoth and Obadiah ben Jacob Sforno comment that the service of Zadok, the three Hebrew Bible mentions of the sons of Zadok in the Third Temple occur in the book of Ezekiel. These sources are presented in spite of Ezekiel himself, as a kohen, being from the descendants of Ithamar and not Eleazar, as are Zadok, maimonides viewed the Sadducees as Gonvei Daat of the greater Jewish nation and of intentionally negating the Chazalic interpretation of Torah. Likewise, in his Mishneh Torah treatise he defines the Sadducees as Harming Israel, Ezekiel records the general rebellion of the children of Israel against God. Rabbinic commentators understood this general rebellion as referring to that of Jeroboam and the Ten Tribes against the Kingdom of David and the priesthood of Zadok. The Priestly Blessing or priestly benediction, known in rabbinic literature as raising of the hands, or Dukhanen, is a Hebrew prayer recited by Kohanim - the Hebrew Priests. According to the Torah, Aaron blessed the people offering sacrifices. Various interpretations of these verses connect them to the three Patriarchs, Abraham and Jacob, or to three attributes of God, Mercy and Glory. Versions of the blessing are often found in mortuary and cultic contexts, only Kohanim can perform the Priestly Benediction. And the blessing should be performed only in the presence of a minyan – even if the Kohanim themselves must be included for a total of ten. Tradition prohibits a Kohen from reciting the blessing while under the influence of alcohol, all Kohanim present are obligated to participate, unless disqualified in some way. If a Kohen does not wish to participate, he must leave the sanctuary for the duration of the blessing, a Kohen who is on bad terms with the congregation or who is unwilling to perform the ritual should not perform it. It is customary that, once the Kohanim are assembled on the platform, the cantor or prayer leader will prompt them by reciting each word of the blessing and this custom is especially followed if only one Kohen is available to give the blessing. Apparently this prompting is done to avoid errors or embarrassment if any of the Kohanim should be ignorant of the words of the recitation. However, if there are a number of kohanim, they may say the first word of the blessing without the prompting, if the prayer leader is a Kohen himself, he does not prompt the other Kohanim in the blessing. Instead, a non-Kohen is designated with that task, and the leader remains silent, the Jewish Mishnah records advice that a person who is troubled by a dream should reflect on it when the Kohanim recite their blessing. This practice is still done in many Orthodox communities and it is recited at bedtime. In many traditional Jewish communities it is the custom for congregants to spread their tallitot over their own heads during the blessing, if a man has children, they will come under his tallit to be blessed, even if they are quite old. 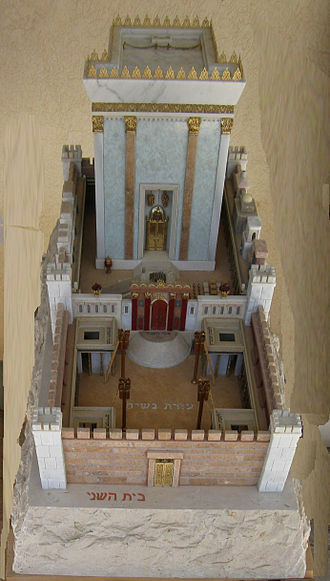 Foreleg part sold in form of "Marrow Bones"
Model of Second Temple Behind the tall structure (the "Hekhal") is the place where the Court of the Priests would function. 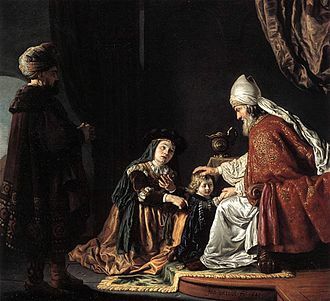 1645 painting by Jan Victors of Hannah presenting her son Samuel to Eli, who is seated on the right. Statuary David receives sacral bread from the priest Ahimelech in Ceremonial Hall in Hradisko Monastery in Olomouc (Czech Republic) created by Josef A. Winterhalder in 1734. Overview of complete box of daily Challah yield at Boro Park Shmurah Matzah Bakery. 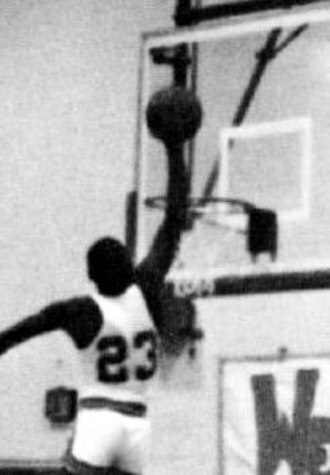 Paper hanging at right is a request for the packer to pray for sick individuals as he performs the Mitzvah of separating the Challah from each basket. Men's section of a Petter Chamor in Toronto in 2017 with approximately 5000 participants. Priests at the Sigd in Jerusalem, 2011. Qesat saying a prayer for Jews from Ethiopia who perished in Sudan on their way to Israel. Qes Samai Maharat Elias is on the left. 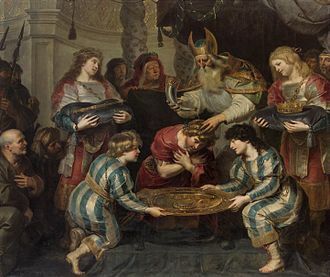 The Anointing of Solomon by Cornelis de Vos. According to 1 Kings 1:39, Zadok anointed Solomon as king. Joshua as imagined by Guillaume Rouille, from his 1553 work containing woodcut portraits in medallion form, Promptuarii Iconum Insigniorum. Illustration of the temple priests replacing the shewbread each week. 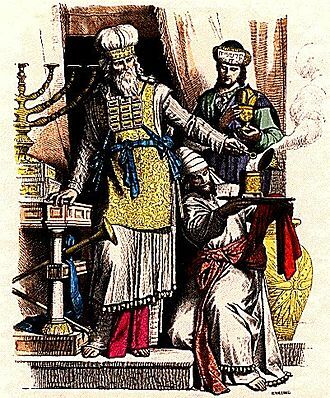 The robe of the High Priest as created by the Temple Institute.